Good barbers use a quality shaving brush to facilitate the optimum shave. After 3 years in development - this is a revolutionary, new type of shaving brush. Probably, the first significant change to the shaving brush in over 250 years and men-u believe it is simply the best shaving brush you will have used! 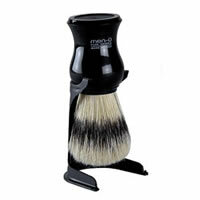 FHM Grooming Award winner in 2004, the Barbiere Shaving Brush and stand also comes with a FREE men-u Shave Creme.